In a home renovation project, there are many moving parts, but only two fundamental elements: planning and design. Each is a separate, yet dependent activity. And neither should be given short shrift, for when they come together flawlessly, as in a symphony, perfectly performed, they reveal themselves to be what they truly are – sister arts. These two sibling crafts are at the centre of the story of the re-imagining of this three-storey house in Toronto’s Little Italy district. The office features an antique banker’s desk that is a family heirloom and a spectacular floor-to-ceiling bookcase that was custom-made by Norcab. “We were looking for a house that felt like home,” explains Nicola Hockin. It was a simple objective, yet one that was difficult to quantify. That is, of course, until they found it. The bathroom on the second floor features a pure white Caeserstone countertop, gold light fixtures from West Elm and Cercan floor tiles. The black plumbing fixtures are by Baril, from Roman Bath. What it didn’t have was a functional basement, nor the right layout and look on the main and upper floors. Perhaps to some, these hurdles may have proven too cumbersome to overcome. But not for these two. They had a plan. And they had a team. That is where designer Kirsten Marshall and contractor Nuno Teixeira came in. So the planning and designing began. The fireplace surround in the living room is a black powder-coated steel sheet framed by a thick slab of black honed granite. Built around 1910 on a prominent old street in Toronto’s Bathurst and Bloor area, the house had already undergone a major renovation in the 1990s. “A lot of the ornate character had been removed,” says Marshall, the principal at Palmerston Design. The first order of business was digging out the basement because no one taller than 5-foot-6 could stand upright in the space. In the basement, they then installed a gym, and a laundry area and now have space for a den. Then, they turned their attention to the main living areas. The window in the kitchen was changed to accommodate a new linear configuration, giving the space a sleek look. The countertop and waterfall island are clad in Caesarstone quartz. Black faucet: Brizo; stools: Urban Mode. Removing several walls necessitated reframing much of the structure with large steel beams, says general contractor Teixeira, the owner of Caliber Group, which oversaw all the work. The main-floor family room is a few steps below the dining room. It boasts wide sliding glass doors, custom-made storage space and a gas fireplace set in a concrete floor-to-ceiling surround. On the list of must-haves were an open main floor space to give the house a good flow, a walk-in closet for each of the owners, a master ensuite bathroom, and a nursery. What they ended up with is a clean-lined modern home with a unique timeless charm, and a stately exterior. It is a place that now not only feels like home, but looks the part, too. 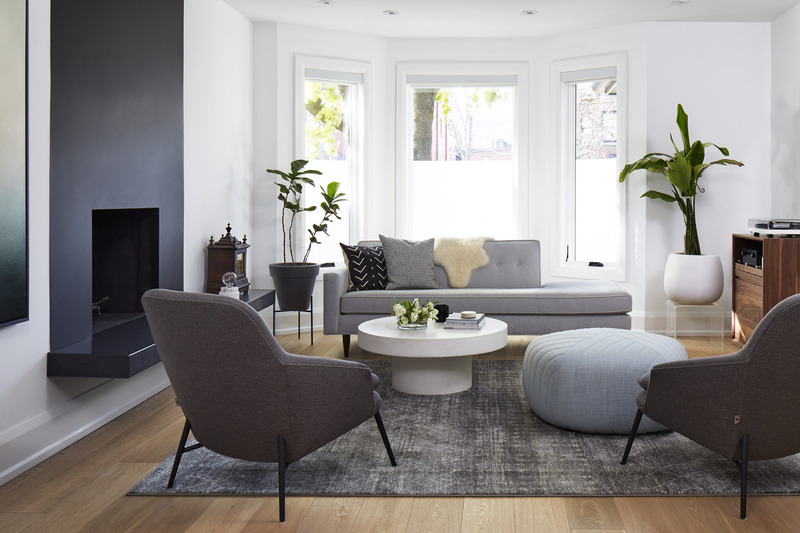 With more than 3,500 square feet of living space, the new look offers plenty of room for everyone to have a different favourite spot. “I love the living room,” says Marshall, who then gets more specific: “The elevated fireplace.” The old brick fireplace, which had been painted in a previous renovation, was replaced with an elevated hearth made of honed granite, suspended off the firebox. The hearth also doubles as a bench. The surround is a stunning to-the-ceiling sheet of matte-black powder-coated steel. White oak floors extend into the dining room, which has a steel-framed table finished with white oak, purchased at Calligaris. The Nelson Bubble Light above the table is from DWR. The third-floor guest bedroom features a small sunroom and skylight. This space was simply reframed and carpeted. The man of the house is not without his favourite spot, too. The upstairs office, with its custom floor-to-ceiling showpiece bookcase is designed to almost exact specifications to how Nicola’s husband, Mark, envisioned it. “He came to us with an image of a bookcase that he loved,” Marshall says. And that is how it was designed, right down to how each shelf should be subdivided. The makeover of the house, from beginning to end, took about 10 months to complete. “It has this old Victorian-style presence with a modern feel as soon as you walk in,” Teixeira says.